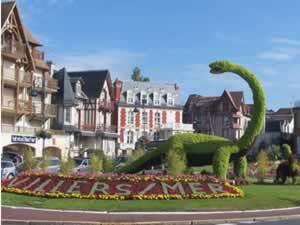 Probably one of the better known areas of France and certainly one of the most popular. It is so easy to reach from the UK. Its varied and contrasting landscape offers an interesting and exciting holiday for people of all ages and it has been attracting tourists and travellers for centuries. 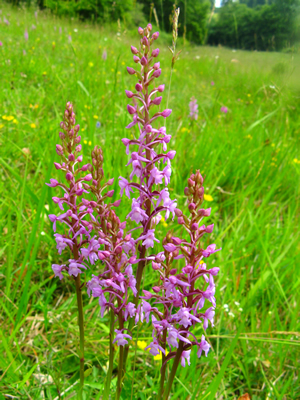 Ticheville is situated in the Pays d'Auge area of Normandy in the department of Orne, a lush and unspoilt, traditionally farmed area of rolling orchards, woods and pasture land rich in wildlife and amazing wild flowers including many rare orchid species in spring and summer. 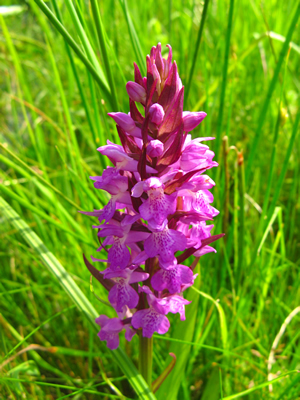 (Daniel is very proud of discovering a military orchid in a field near us, first time it has been recorded in Normandy for 20 years!). Beautiful villages and towns adorn the landscape. 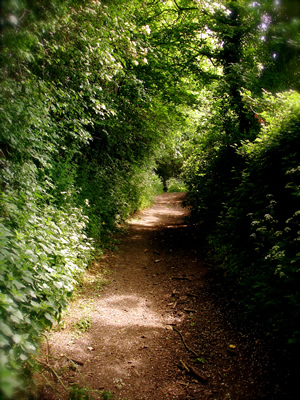 A perfect place for walking or cycling (we have 2 bikes available for guests) down secluded paths and bridleways or quiet leafy lanes. For a holiday full of days out, you will find yourself perfectly situated here at La Maison du Vert for reaching all of Normandy. If it's sun, sea and sand you are after, a trip to Trouville and Deauville will take you to the more popular seaside resorts with beautiful beaches, stylish boutiques and trendy cafés. In addition to 'Mont Saint Michel' there are many chateaux, churches, cathedrals and monasteries which make up an impressive architectural heritage, while reminders of Normandy's important role in past wars can be found in almost every town you choose to visit during your stay. 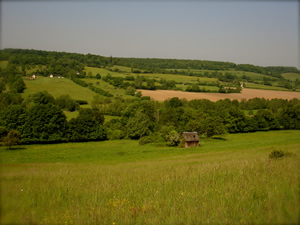 For those hoping just to relax and escape the rush of modern life, the Pays d'Auge is a paradise of peace it will remind you of England in days gone by. 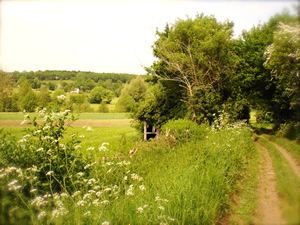 La Maison du Vert is the perfect place to wind down, soaking in the countryside. Come and lounge in our beautiful gardens with a pot of tea (or glass of wine!) and a good book. 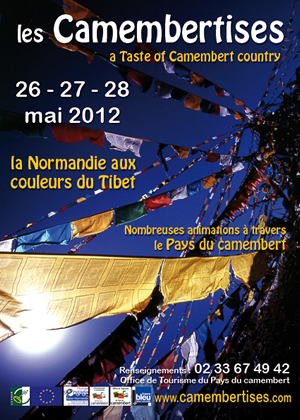 Every year in spring the local tourist office organises a special weekend, click on the image for more information. 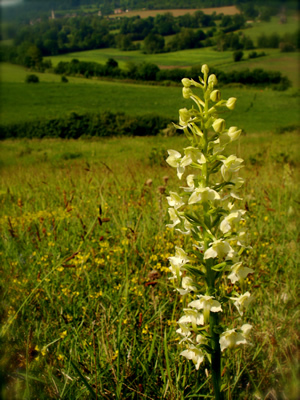 Also click here for some beautiful images of the local area on the Camembert website. 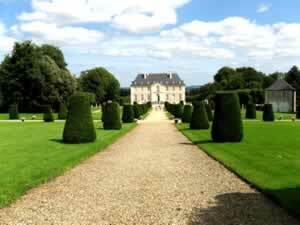 There are so many beautiful Chateaux in this area of Normandy, you are really spoilt for choice. Below is a simple list of the ones really worth going out of your way for, but it depends on what you are impressed by as to which you choose to go to! Some charge a small fee upon entry, others are free. Leaflets available in the guest lounge. 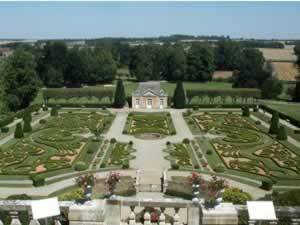 An eighteenth century chateau with a French Arts and Crafts garden designed by Achille Duchene, in the 1920s, with topiary, hedges and a parterre de broderie. The castle now lies in ruins beside the Orne river. 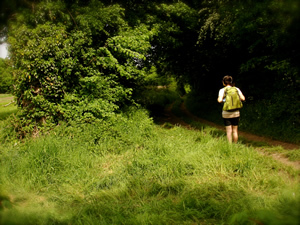 However, its park and gardens, extending for about 4km along the river, offer the prospect of many delightful walks. ...and grown ups who like fun! at Lisieux, on 'Rue Joseph-Guillonneau', open every day. This is a fantastic swimming pool with a 54m long toboggan, jacuzzis and solarium. A conservation Zoo. 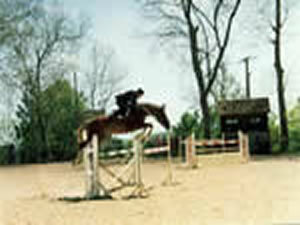 All the animals are in huge enclosures and extremely well cared for. 10km North of Lisieux, at Hermival-Les-Vaux, you will find this zoo offering safaris to see lions, tigers, rhinos and apes every day from 10.00 o'clock. There are huge picnic areas, and a mini train to take you round the whole circuit, with commentary! 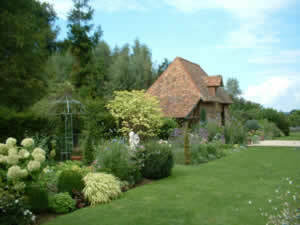 at Caen, has a lovely play area for all ages with beautiful and hot houses, all free of charge! 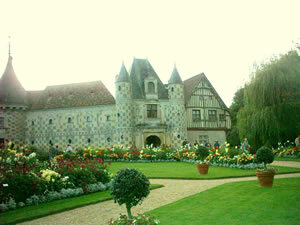 at the Chateau de Vendeuve. 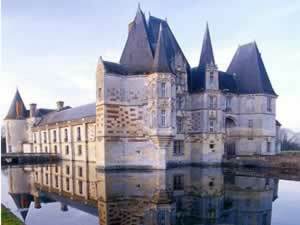 The largest stud in France, the whole family should enjoy a trip here. 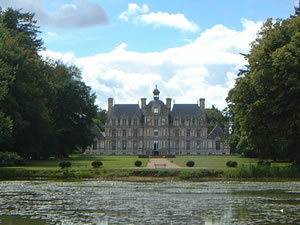 Daily displays plus films.Tours of the Chateaux, there is nice parkland for a family picnic! Don't forget this is not an exhaustive list of days out with children available! 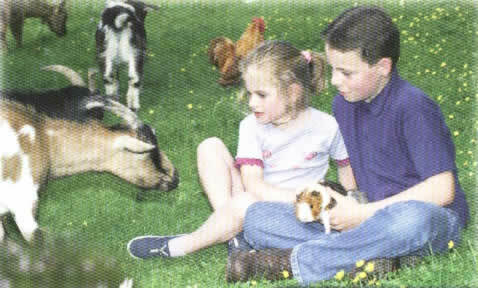 Maybe your children would like some of the ideas we have listed for adults, such as visiting chateaux, gardens or of course, the beach! Have a browse through the leaflets in the Guests' Lounge for more ideas, too. 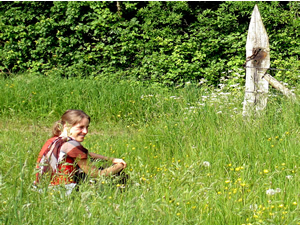 There are so many beautiful and inspirational gardens in Normandy. We have a colourful map available, please ask. 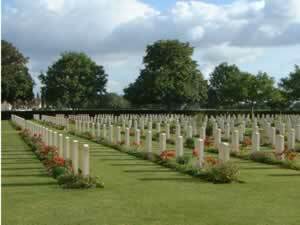 today, the Normandy soil is the final resting place for almost 20,000 young soldiers who never returned after that fateful day. 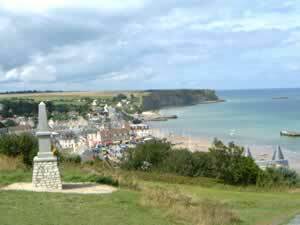 In 1994 as part of the plans for the 50th anniversary Commemorations it was decided that the sacrifices made in Normandy during World War 2 should never be forgotten. Today there are some wonderful museums and different itineraries for the tourist to follow in order to discover much more about the unfolding of this battle, upon which the outcome of the Second World War depended. In the Guest Lounge [and any tourist office you visit] you will find excellent leaflets about the areas in which battles took place, and the role that battle held in relation to the final victory. The leaflet details routes to take in order to pass through the most sites and places of interest. The landing at Utah beach, which many of us will have heard of through 'Saving Private Ryan' took place around Sainte-Marie-du-Mont, just East of Sainte Mere Eglise on the map. Closer by we have the Musée Leclerc in Alençon, the Musée 'Juin 44' in L'Aigle and Le mémorial- Un Musée pour la Paix, in Caen. 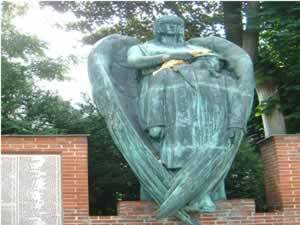 Just 10 minutes from here is the excellent museum, the Montormel memorial. Perched at the top of the valley where the battle of Normandy ended. There are films and exhibitions, very moving. There are just so many places to see, this area is just so full of interesting towns with lots of character. Here is a selection of places people most often visit. 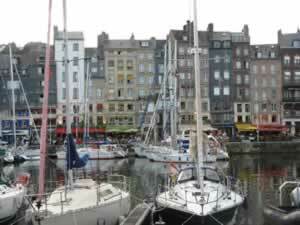 A must see, a favourite with all our guests, 1hrs drive from here, Honfleur is an old fishing port that is like a living museum. The tall houses surrounding the port are just amazing. Lots of lovely cafés and restaurants line the streets along with numerous antique and art galleries. Great for people watching. There are also beautiful public gardens and a long stretch of sandy beach. 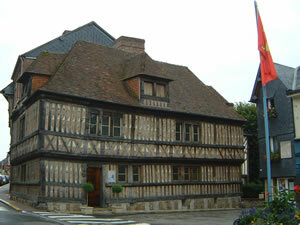 The other Museum is the House of Camembert opened in 1992. From the outside it resembles an open Camembert cheesebox. In season, it is used for exhibitions. You can have a nice tasting session here. 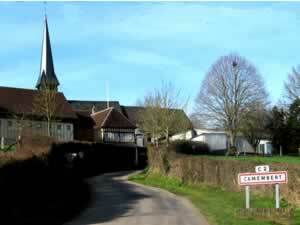 Camembert tourist office Website Just 10 min drive away. If you don't eat cheese made with animal derived rennet then Camembert currently is not suitable for you. Camembert sold in the UK and other countries may be suitable, check the label. 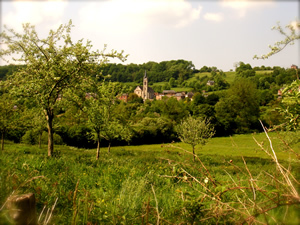 You can go to Orbec and then on a further 10 minutes to Bernay below. Good market which lines the main streets on Saturdays. The Historical capital city of Normandy, on the River Seine, and currently the capital of the Haute-Normandie (Upper Normandy) région. Once one of the largest and most prosperous cities of medieval Europe. 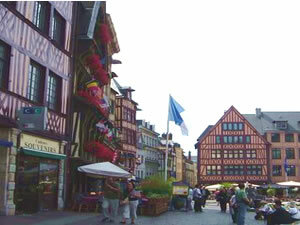 Rouen is where Joan of Arc was burnt at the stake in 1431. The stunning Notre Dame cathedral is worth a visit, there are also many museums. The building in Rouen are magnificent and the cobbled streets are a delight. Lots of good antique shops and restaurants too. The coastline of Normandy leaves you spoilt for choice for beaches. 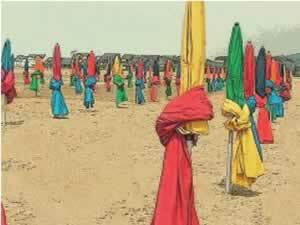 Deauville and Trouville are right next to each other, both worth visiting for their long stretches of sand, Deauville is the Cannes of the north, with it's yearly film festival. The casino is an elegant building and has restaurants a night club and a cinema. The town is full of designer boutiques, antiques and homewear shops. It has an expensive feel. There are tubs and hanging baskets flowers everywhere. 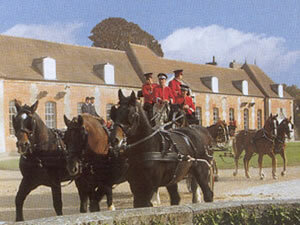 The Deauville tourist officewebsite. 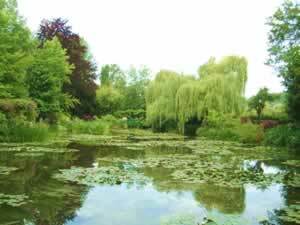 A beautiful place to visit, Giverny is a delightful little town but Monets garden is of course the main attraction. One of the most visited places in the whole of France, unfortunately that means you won't have it to yourself! It is worth a visit though but be prepared to queue. The Musée de Art Américaine gardens opposite are also worth a look. 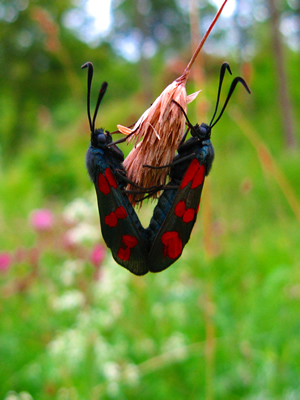 (and they are free) they also have a nice restaurant Monets Garden website. The drive will take you 1¾ hours or 2¼ hours scenic route avoiding busy roads. The coast is full of lovely beaches, Villers sur mer is a nice seaside town with a good sheltered beach, lots of shells to keep the kids amused. If you have a wi-fi laptop with you the you can surf for free at Villers-sur-mer. Just go to the tourist office with proof of ID and they will get you connected! The town of Bayeux is of course famous for the Bayeaux Tapestry a 70-m long piece of embroidery that graphically tells the story of the 1066 Battle of Hastings. 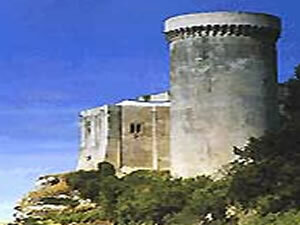 A very popular place to visit, lots of our guests have said they found it was way more interesting than they expected. 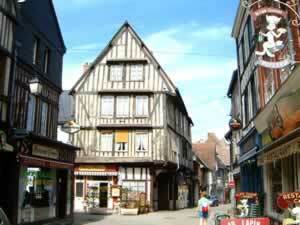 The town is lovely, filled with beautiful half timbered buildings that escaped the bombings of WW2. It is 1½ hours drive from here. UNESCO classed the Mont Saint-Michel as a world heritage site in 1979 and this mecca of tourism welcomes more than three million visitors a year. The beautiful old lanes are full of little shops and restaurants but this only adds to it's attraction. The buildings are amazing and the views are breathtaking. 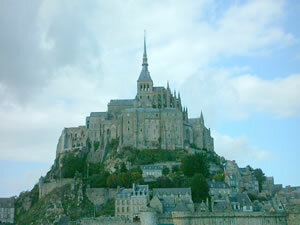 It has an interesting history which you read about on the official Mont Saint-Michel website. 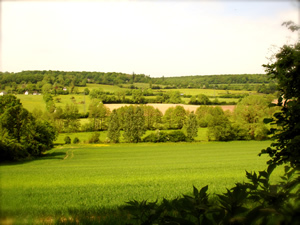 The drive will take you about 2½ hours, a lovely day trip, there are some lovely routes you can take through the countryside. The Birthplace of William the Conqueror. 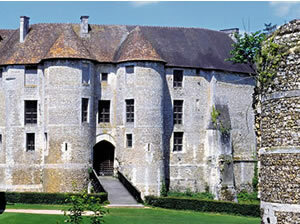 The Castle is perched high above the town with great views of Falaise and it's surroundings. The recent renovations have been made in an interesting and modern way. You will get a head set to guide you around and tell you the castles history. Definitely worth the visit. 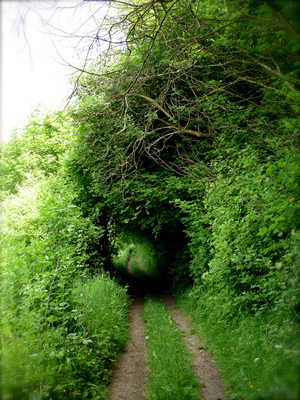 40 minutes drive form La Maison du Vert. 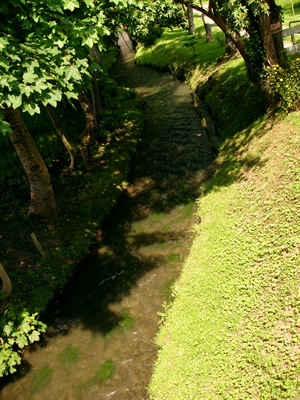 Just 5 minutes away by car, you will find the small local town of Vimoutiers. Not only does it have everything you might expect from a typical French town, such as bakeries, newsagents, post office, chocolate shops, gift shops and more, there are some lovely bars that look out over the main square, where you can bask in the sunshine and have a refreshing drink whilst you enjoy the relaxed French lifestyle. The tourist office in Vimoutiers can provide lots of useful information such as opening times and entrance fees for special places you want to visit. 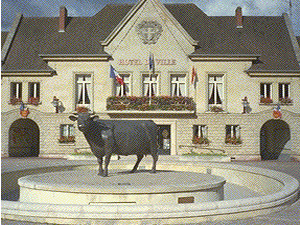 It is situated to the left Hotel de Ville not far from the official Camembert Museum, where you can find out all about the history of this much-loved cheese. 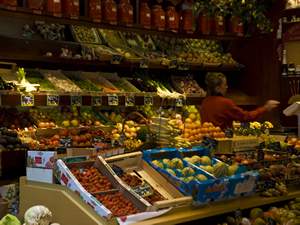 The Markets in Normandy are always bursting with fresh local produce. You will also find stalls selling gifts, clothes, jewelry, arts and crafts, watches, fabrics, housewares, in fact just about everything! Saint-Pierre-Sur-Dives a large and very French market in the morning. Vimoutiers has a much smaller but still interesting market on Monday afternoons, beginning at about half past 2. L'Aigle. The third biggest market in France, this sells all sorts! Alençon, Argentan, Le Sap, Thury Harcourt. Alençon, Bayeux, Honfleur, Lisieux, Orbec, Potigny. L'Aigle, Bayeux, Falaise, Flers, Gacé 2p.m., Honfleur, Le Sap, Sées, Lisieux. Argentan, Alençon, During the summer and Easter only there is a traditional market at Cambremer on Sundays. The markets at Trouville and Deauville operate alternately every day of the week. In May, the market at Orbec is a flower market. This is just a guide, please check with the tourist office as market days sometimes change. 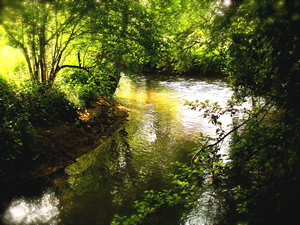 This photograph of Ticheville was taken with a zoom lens from the other side of the valley, part of a beautiful circular walk of either 2 or 4 hours that takes you through woodlands, orchards and alongside the river Touques. Click here to see photos of this walk. 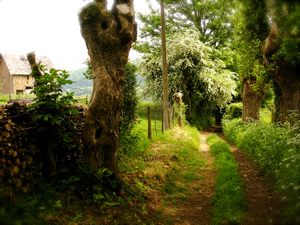 The local countryside is so attractive and walking or rambling is probably the more stimulating and refreshing of ways to discover it all. For some excellent local walks ask us for our informative guides and maps which can give an idea on the difficulty or length of the walk. 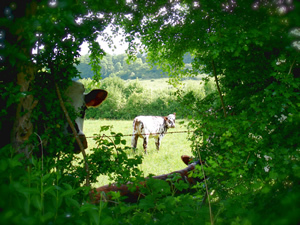 As you can see we are situated in the middle of a beautiful green valley; Ramblers take note! 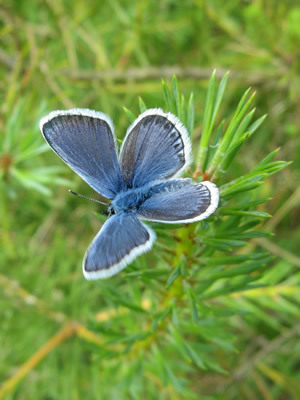 We really don't think that you need to get in your car and go further afield, as we find there is so much beauty to see around here that it is a shame to miss out on it. The locals have reputations for being hearty eaters who appreciate good cooking. Just about every town you visit will have its specialties, but unfortunately for us veggies most of these consist of meat and fish! 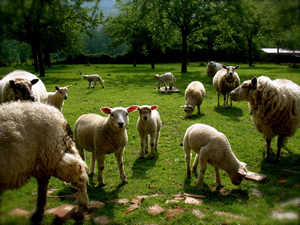 Even the local cheeses are made using animal rennet [an enzyme from the stomach of calves. So although a trip to the local cheese farm is very interesting and a visit to Camembert and its museum a good day out, be warned if you are a strict vegetarian; their produce is not suitable for you as it uses animal derived rennet. Please note all the cheese we serve is suitable for vegetarians. We can give you a list of vegetarian cheeses you can buy in the supermarkets (made using vegetarian rennet). Otherwise, we think the solution to the problem of so many meat-based specialties is simple- sample the local pastries, sweets and drinks! The traditional desserts and pastries are dominated by the abundance of apples and pears in Normandy. At just about all the markets and bakeries you will find a selection of excellent, subtle and often unusual jams and jellies [confitures]. Vimoutiers has a selection of excellent bakeries. 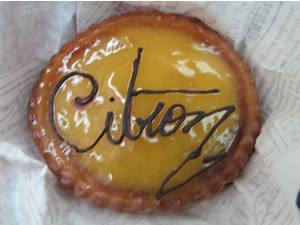 We'd recommend their Tarte au Citron and, if you are able to find one, a Pavé, although these are more often available in Gacé. From Caen and Putanges you can buy Calvados-flavoured cream chocolates; from Isigny there are caramels (called chiques or balivernes) while from Bayeux, Caen and Falaise you should try the famous boiled sweets- Berlingots. And don't forget Rouen's delicious sugar apples! 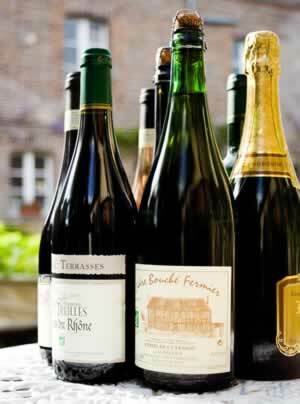 France, of course, is internationally renowned for its wine and a good meal here always calls for a bottle of excellent French wine. We offer a range of organic, vegetarian wines on our wine list. Normandy however is unusual in that it doesn't have a lot of its own vineyards, so most of the traditional drinks are apple-based. Also known as Calva, this dates back from the 16th Century. It is a cider brandy, distilled twice and matured in oak casks for 6-10 years. It is a distinguished after-dinner drink and it is claimed to help digestion. The locals traditionally take a Trou Normande- a calvados sorbet- between courses to revive flagging appetites. We recommend Calvados as a fine after-dinner tipple to complement your meal. This is made from 2 parts apple juice for every 1 part of Calvados, and is aged for 18 months in oak casks. It is served locally as an aperitif, or sometimes with dried apples in the afternoon or as the perfect accompaniment to apple pie. Very similar to Baileys, it has the softness and sweetness of cream, with the nobility and flavour of a grand Calvados from Normandy [that's what the label says, and it truly is delicious!]. Probably one to have as an after-dinner treat than an aperitif. 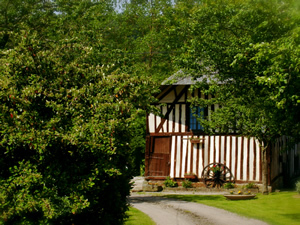 Cider has been made locally in Normandy since the middle ages. 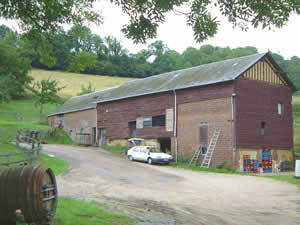 The local area is full of traditional farmhouses offering cider produced using age-old methods. Most bottles you'll find in supermarkets are made in industrial factories. We purchase all of our Cidre (Apple cider) and Poiré (pear cider, see below) from an organic farm 5 minutes from here just outside of Vimoutiers. The owners, Monsieur and Madame Schreiber, are always delighted to offer tasters and show you around. They also make delicious Pommeau and Apple juice. There are leaflets, with a small map on them, available in the Guests' Lounge. Poiré is made using the same process as cider, but using pears [other ciders use apples]. Its up to you which you choose! Again, all of our pear cider is organic. 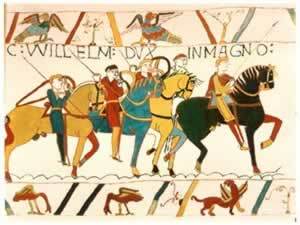 If you fancy an aperitif why not ask us for the traditional Normandy aperitif: Kir Normande. This is ice-cold apple or pear cider served with a dash of either crème de mûre [blackberry liqueur] or crème de cassis [blackcurrant liqueur]. Delicious! 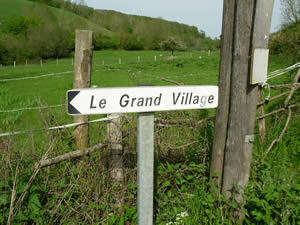 The beautiful 'Le Grand Village' walk. 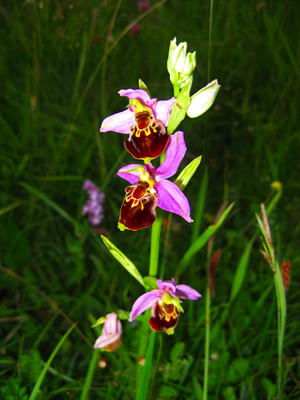 A circular walk from our hotel of either 2 or 4 hours that takes in beautiful scenery typical of our area, the winding river touques, rare wild orchids, normandy cows, traditional half timbered houses and cider apple trees. Take one of our picnics and enjoy your day! Thank you to Brittan Osborn for some of these lovely photos.